This impressive antique Edwardian sterling silver presentation bowl has a plain circular rounded form onto a circular spreading foot. The upper portion of the body of the silver bowl is embellished with a fine and impressive band of embossed floral and foliate decoration. The anterior surface of the flared rim is encircled with an applied bead decorated border. The circular foot is ornamented with a band of impressive embossed leaf and bead decoration in addition to further applied bead decorated border to the rim. 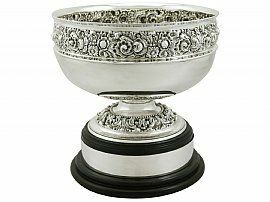 The underside of the Sheffield silver bowl bears the retails mark 'Walker & Hall, Sheffield, England'. This antique presentation bowl is a very good gauge of silver, fine quality and in exceptional condition.